My friend Heidi is one of the most creative people I know. But not in the way you think. Most people associate the word ‘creative’ with someone bedecked in colorful scarves and bohemian jewelry, painting Jackson Pollack-style, maybe while even wearing bells around her ankles. They probably also have cool glasses of a retro shape and a primary color. Heidi doesn’t fit that picture. I’ve known her from a time she loved stripes, jeans, and converse. Her style has definitely become more classically Kate Middleton, but Heidi’s creativity is beyond style. The nine time zones present a challenge, but because we’ve got a hunch that ten years of friendship doesn’t end here, but simply changes the nature of our friendship, Heidi’s creative gifts have had a chance to shine. Her first challenge was to record ‘A Day in the Life’ through pictures. That was fun, and so helpful to see more of each other’s worlds. The second challenge is what you’re reading about today: to find and capture (all on my iPod…the camera’s still in Florida) my top 10 favorite things in Amsterdam. This is by no means an exhaustive list or an actual ‘best of’ for a city. This is my own simple list of what I’ve enjoyed so far in the short time I’ve lived here. I’m excited to see how this list grows and changes. So, Heidi, thanks for being you and finding a way to creatively enhance our friendship, despite the nine time zones. 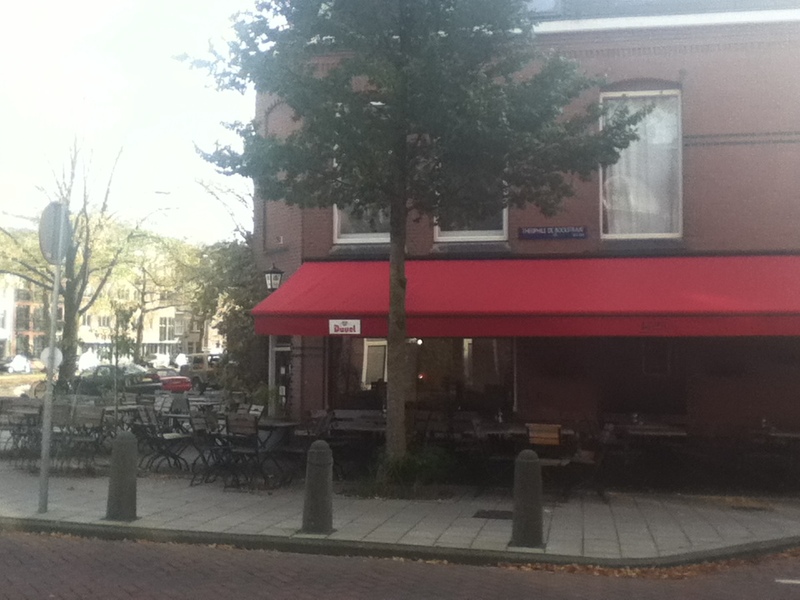 Het Juttersdok, a tweehand winkel. 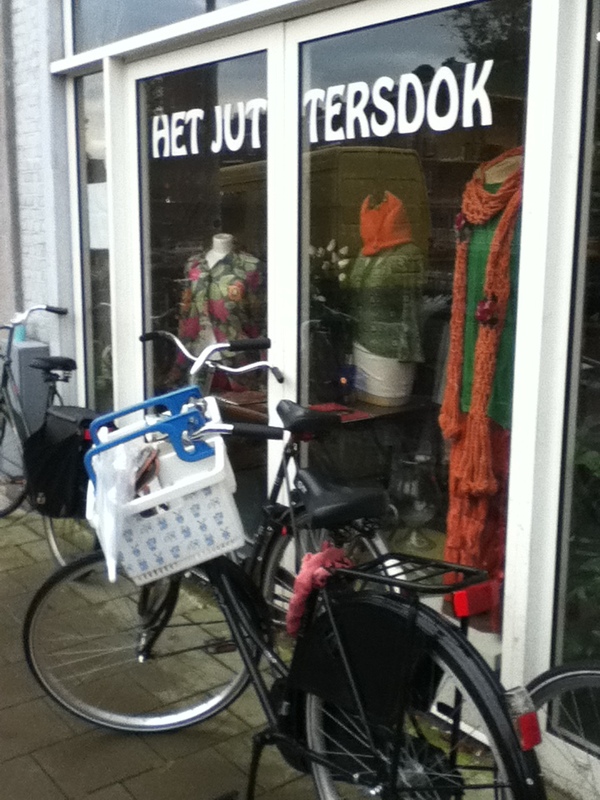 For you English speakers, that would be bad Dutch for, Het Juttersdok, a secondhand store. I love secondhand stores, and although there are bigger ones out there, I love the neighborhood of this one as well as its electic mix of antiques. I know it’s cheesy, but this is our living room. I’m very proud of it…Frans and I have worked hard in the wee months of our marriage to make the apartment ‘ours,’ and I feel we’ve succeeded. We’ve painted every inch of every surface of ceiling, door/window frame, and wall. The lampshades were secondhand, 4 euros each. The curtains were free thanks to Frans’s family, and the “peacock-colored” pillow covers were made for us as a wedding gift from our friend Tina. The table between the chairs we found on the street and painted. The bookshelves we bought at a bargain and painted ourselves. The books were smuggled over in suitcases. They were heavy, but it’s nice being surrounded by my old friends (yes, I mean the books). Piano, chairs, and couch were all Frans’s. The coffee table is a secondhand buy and refurnishing project. Best of all, the view. Rembrandt Park. 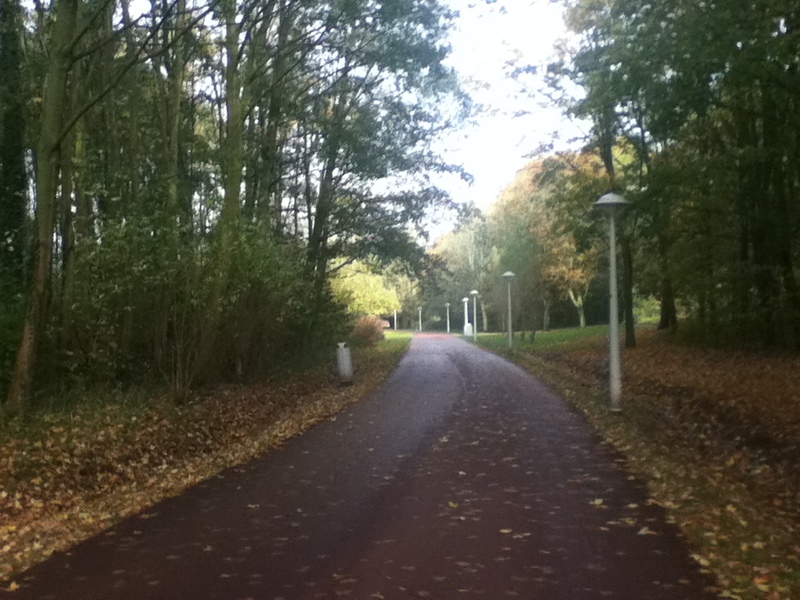 This is my path to either of my favorite secondhand stores, Het Juttersdok included. 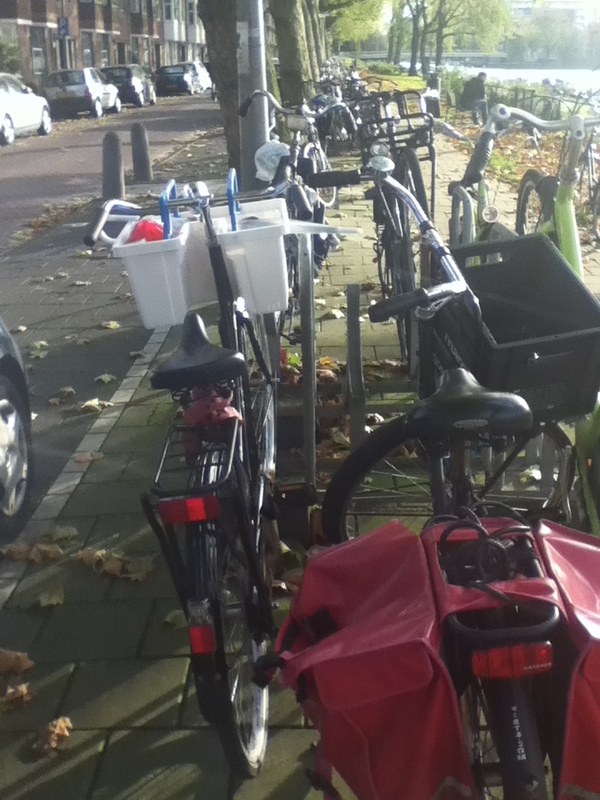 It’s also the way to Hema (the Dutch Target). I still have to say my favorite park is Vondelpark, but Rembrandt Park is a close second. It even has an outdoor gym! The Anne Frank Huis. So, try not to covet, because I know most of us Americans have grown up reading the Diary of a Young Girl in school. In fact, the Anne Frank Huis was one of my ‘must sees’ when I was here last December to visit Frans. 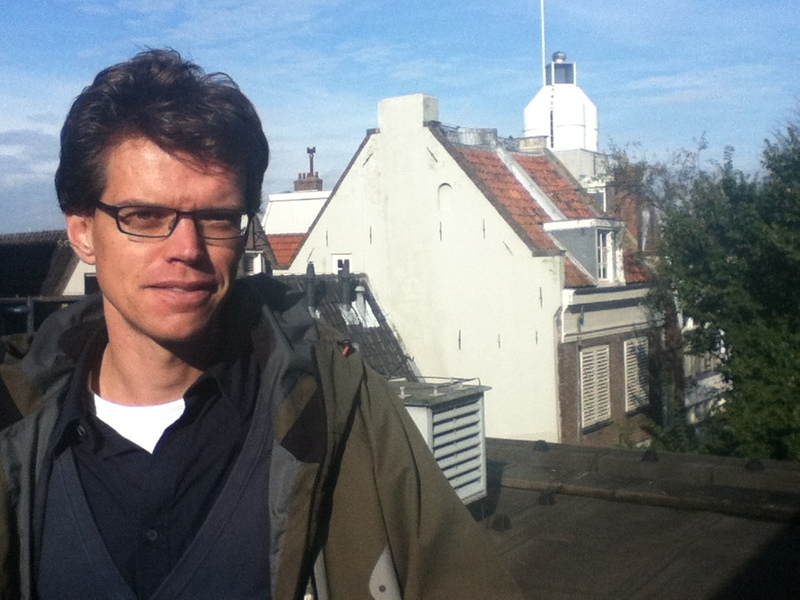 Here is my friend Willem Pieter, who works with the Anne Frank Huis in project development. He’s a super smart guy who got a degree in history, and I was fortunate enough to meet up with Piet for lunch, right after this pretty amazing view of the Annex (where Anne and her family hid). 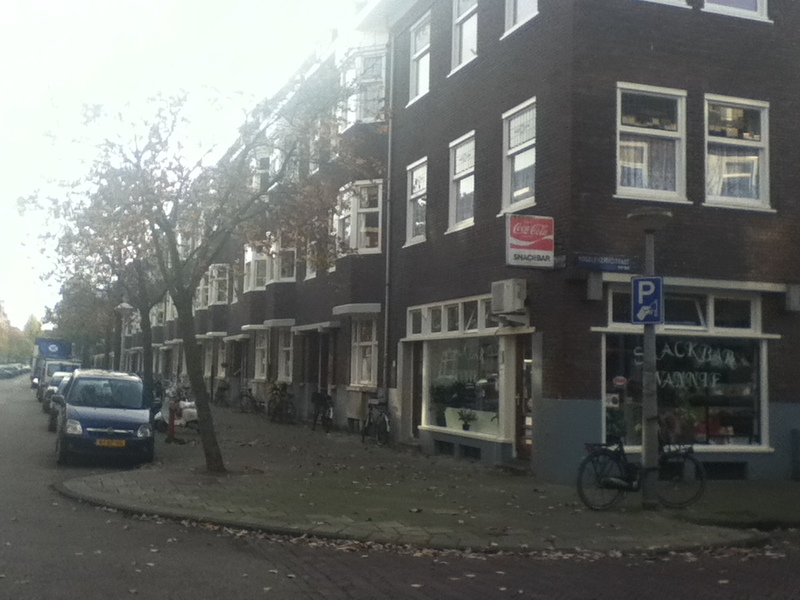 The Annex is on Piet’s left, the gabled house with the two shutters. Piet remarked that Anne’s family was lucky: Otto Frank owned the building in which his family could hide, was able to keep the business running to support those who were hiding, and had connections beyond Jewish community…Miep Gies being the most famous, who risked their lives to smuggle food and information to the Annex. In total, I found, 75% of Holland’s Jews were killed during the Second World War. I feel a whole blog coming on about this one…but let’s be fair to the other spots and move on. 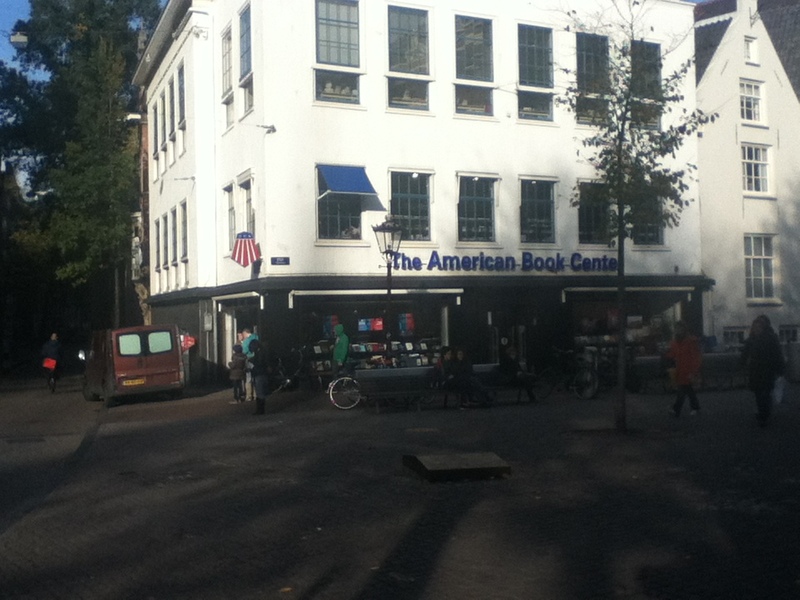 The American Book Center. This one’s on the Spui (a street running through the heart of the center of Amsterdam). Sorry for the terrible photo. As I mentioned before, it’s not easy taking photos on an iPod when the sun is in the wrong place. I’ve found this place to be a refuge for all books in English, and they have a terrific selection. Their traveling selection alone is worth a visit. 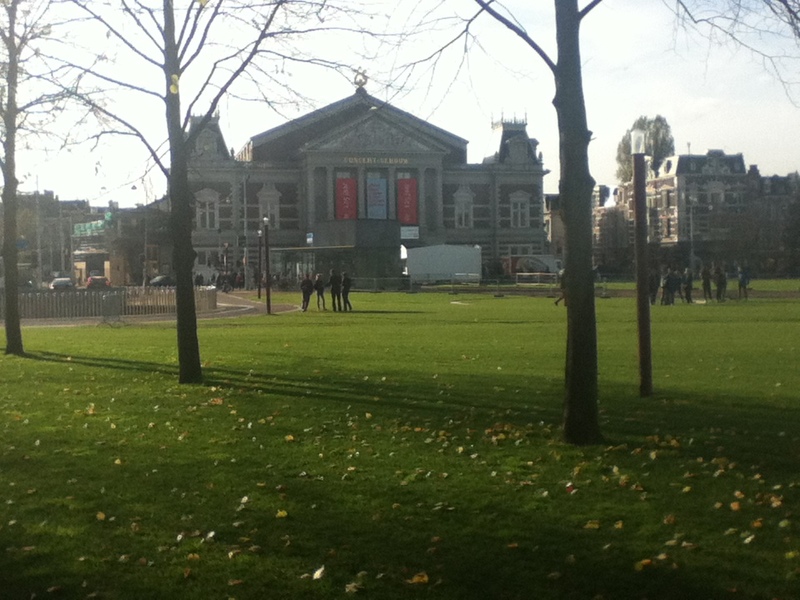 The Concertgebouw. Free lunchtime concerts every Wednesday at 12:30pm. You want to be there forty-five minutes early to get a good seat! 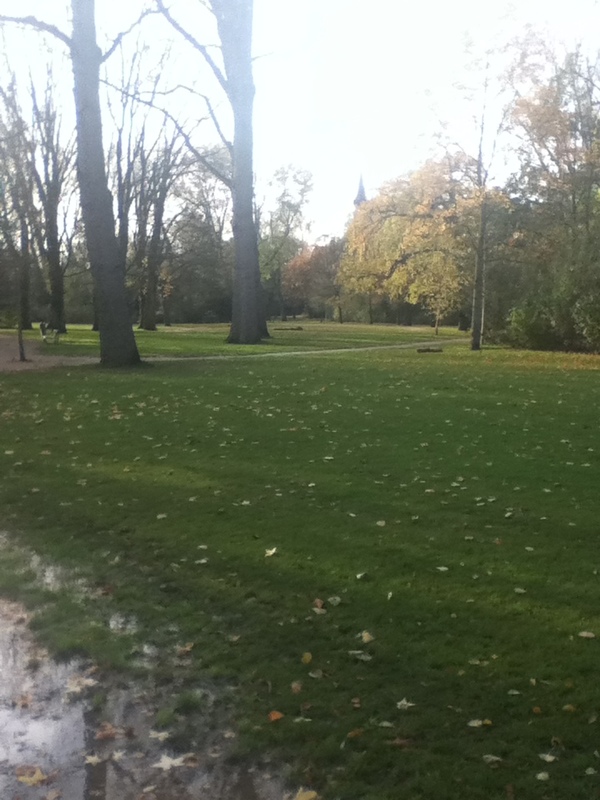 Yes, it’s Vondelpark. Couldn’t keep it off the list. It’s a good place to walk, bike, people-watch, and watch the seasons change. Gent aan de Schinkel. Goose on the Schinkel (the canal that runs just past this cafe). So “coffee houses” in Amsterdam mean different things than coffee houses in the States. Here, if we want to go for a coffee or tea with a friend, we visit a cafe. If we want to go for a joint, we go to a coffee house. Gent aan de Schinkel is on my path from our apartment toward Vondelpark, a mere 5 minutes walk from our place. It’s a cozy place to go in winter, or a fresh place to sit outside when the sun’s shining. I’ve addressed many ‘thank you’s’ here, met some friends here, and had a very productive day of writing. The cappuccinos are good, and the service is friendly. Snackbar Wannies. I’ve mentioned Wannie’s before. It’s the atmosphere that gets me. The coziness. It’s a cold autumn night in Amsterdam. It’s Sunday and you and your husband have just walked your neighborhood. You see the light coming from Wannie’s in the gloomy dusk. You enter the door and the room is crowded, with people sitting on a bench, waiting for Wannie to fry some patats or drop a bitterballen. People chat in Dutch and I can’t understand much, but we’re all neighbors, enjoying our Sunday night. When the order is ready, Wannie drops everything in a checkered paper bag and we carry the bag home, steaming, dreaming of the first salty taste. that’s such a great idea. i will have to send you a day in the life picture collage! Great way of taken people into your new world and life! 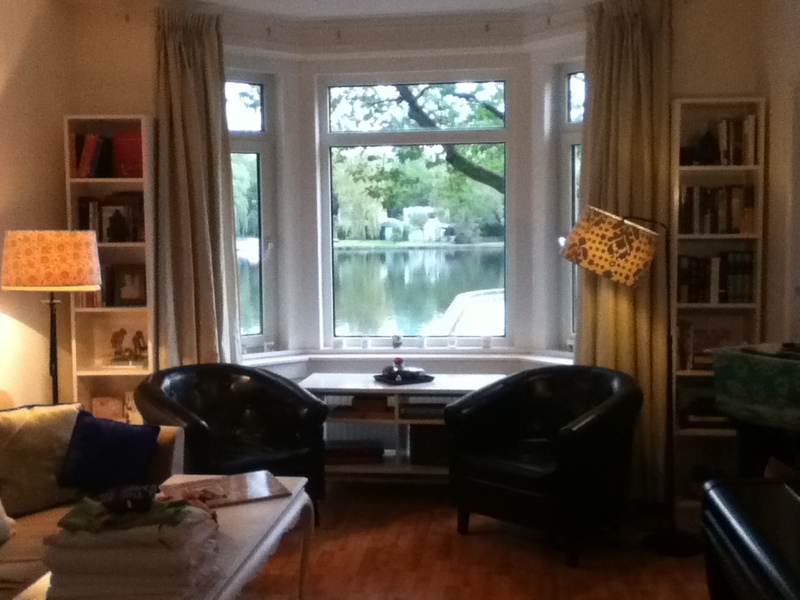 Loved the guided tour, Erin, and your apartment – so cozy & inviting! Stay warm during all your outdoor activities! Thanks to some generous friends, it is cozy. Thanks, Earline. We will!